Factoid #111. In the Dec. 12, 1925 edition of the Ottawa Citizen, 74-year-old Bell’s Corners native William Arnold was interviewed about his early life in the community. His description of the elephants and camels gives us another insight into Richmond life in the 1860s. 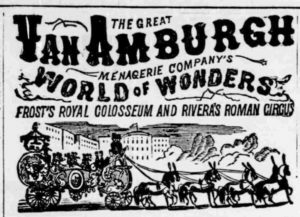 “One of the chief sources of entertainment for the farmers along the Richmond road in the sixties, according to Mr. Arnold was the passing of the occasional circuses which visited Ottawa, Richmond, and Smith Falls. Factoid # 112. On December 24, 1818, as the Richmond settlers were preparing for their first Christmas in their new homes, “Silent Night” was being performed for the first time in Austria. Written in German, by Father Joseph Mohr in 1816, the lyrics to “Stille Nacht, Heilige Nacht” were added to the melody composed by Franz Xaver Gruber in 1818. Each time I hear this beautiful carol I think of the silent nights faced by our ancestors in the wilds of Goulbourn Township and emerging village of Richmond. Both village and carol are celebrating their 200th anniversary. Factoid # 113. There is more than one man named George Brown who played a role in Richmond’s history. The first, a Scottish born merchant, purchased several lots in Richmond in the late 1840s. On lot 8 on the west side of McBean St., (across the street from the Presbyterian Church/rectory) he built a house/store, in 1845. Almost immediately he became active in both the village’s business and political affairs. He was not only a general merchant but was also an insurance agent for the Colonial Life Assurance Company. When Richmond gained its own municipal government in 1851, George Brown held a prominent position. He was a village councillor and when William Lyon, the first reeve, passed away unexpectedly in 1854, Mr. Brown was chosen to fill the rest of his term. He served again in 1858. The 1851 census shows that George Brown and his wife Margaret has a large family – 7 children of which 5 were girls. The 1861 census seems to indicate that 2 more children were born in the early 1850s but then after a five year hiatus a new baby was born to a second wife, Ann. What seems interesting is that there appears to be two living sons called George. George W. was 14 and the new baby, George E. W., was one. In the 1850s and 1860s Richmond was a thriving community and a prosperous place to live but by 1870 it was in a serious decline. George Brown and his family were no longer in the village and seem to have left some time around 1868, but not without leaving a lasting marker. Factoid #114. George Brown is best known as the first proprietor of the store located at the corner of McBean and Strachan St. This stately limestone building was constructed some time before 1863 and after 1856 when he acquired the land from Edward & Margaret Malloch. The building shares some of the features of the Rielly House Hotel. Built in the same time period, they both were symmetrical with decorated corner stones (quoins). The store, a smaller building, has more embellishments. Its gables with returned eaves and ogee (round topped) window in the front gable provide decorative detail. Without a doubt, however, its most unique feature is the rooftop, multi-windowed cupola, which looks out over the village. 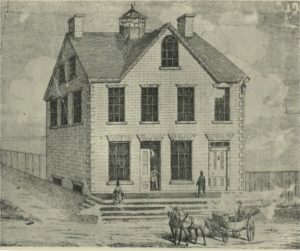 The front door on the left opened to Mr. Brown’s store while the right hand door opened into the stairway to the second floor. George Brown and his family lived here. The upstairs living quarters has decorative paneling and interior shutters on the windows. Sources say that James Scott was the mason and carpenter who built the store. He was also responsible for the carpentry work in the Rielly House. After George Brown left the village, the building passed through several hands until Margaret McKenna gained ownership in 1887. She owned it until 1923. From 1870 to the turn of the century, we know little about the occupants of the building. Around 1900 Robert and James Brown operated a store and in 1905 the renovated building became the site of the Bank of Ottawa. Factoid #115. This is not so much a factoid but rather a question. 3536 McBean St. is the third building north of George Brown’s limestone store. 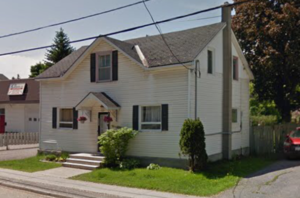 Long ignored by village historians (including me) it is situated on lot 8 McBean St. Could this building be George Brown’s first store/home? The census of 1851 described the building as a one and one half storey frame building. This house is similar in style to many houses constructed in the village between 1845 and 1870 (for example see factoid #52). It differs from most because of the size and nature of the windows on the first floor. The two windows in the front are smaller than normal and the typical six-pane over six-pane windows are missing from both sides of the building. Was it build this way because it was a store and not just a house? Has it been renovated and the windows changed? Do you have an old photo of this building, which you would be willing to share? This entry was posted in Events, Locations, Personalities. Bookmark the permalink. Wonderful additions to your Factoid series. Factoid #115 – A former owner of this house tells me that “someone” told her that at one time it had been a millinery shop or home of the milliner. Does anyone know anything about this possibility?